This is not my usual post. It’s just that I’ve been rolling this idea around in my head and heart recently, and I haven’t been able to get away from it. It’s a little deeper thought… and almost purely spiritual. It may seem like semantics, but it is a subtle nuance which has the potential to revolutionize our perception of God and His intentions toward us. Have you ever noticed that we can somewhat accept that God would condescend to walk with us, but we struggle to accept that He would invite us to ascend to walk with Him? I think it is because the first could be viewed as pity, while the second invites intimacy. We can envision that a loving God would stoop to help us in our hopeless condition. Yet when it comes to Him being so interested in us that He would invite us to come spend time with Him as a friend, we can barely wrap our minds around it. Isn’t relationship why He created us in the first place, though? He had angels. He didn’t need more servants. He had created beings who worship Him non-stop. He didn’t need more worshipers. He wanted family. He wanted friends. He wanted… and still wants… people who want to be with Him. He does not simply stoop to meet our needs out of His abundance and superiority. He reaches out a hand of companionship and invites us to walk with Him… talk with Him… enjoy time with Him… and allow Him to enjoy being with us. 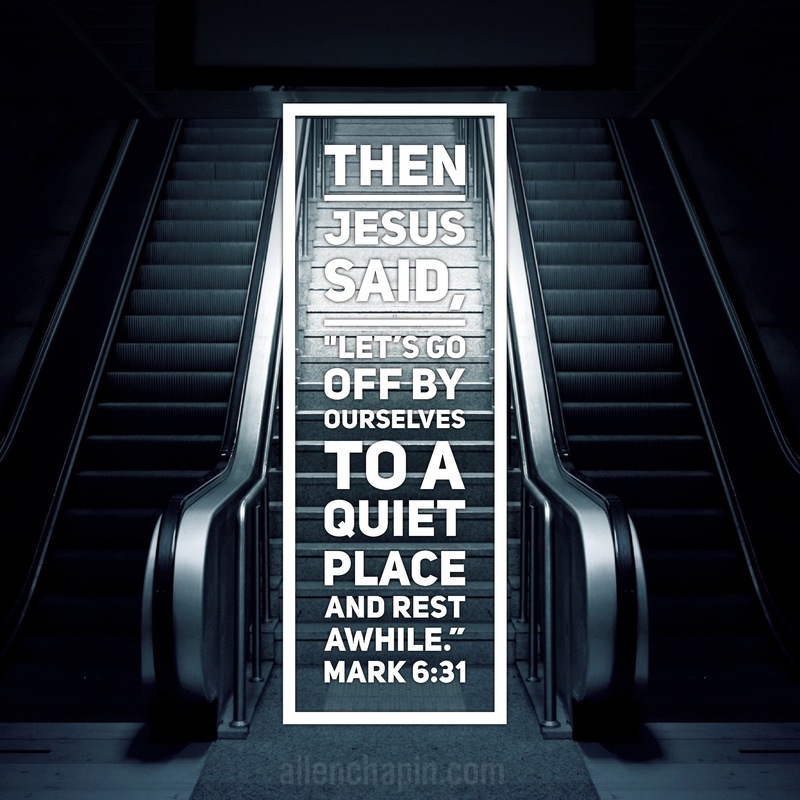 Just like Jesus invited His disciples to get away with Him so they could have some time to just relax and be together, He invites you today to just be with Him. And that momentary invitation extends to on-going relationship. Next Post: Theirs Or Yours? Thanks a bunch for sharing this with all people you actually recognise what you are talking about! Bookmarked. Excellent website. Lots of useful information here. I am sending it to several friends ans additionally sharing in delicious. And naturally, thanks on your effort! excellent post, very informative. I’m wondering why the other specialists of this sector do not notice this. You should continue your writing. I am confident, you have a great readers’ base already!